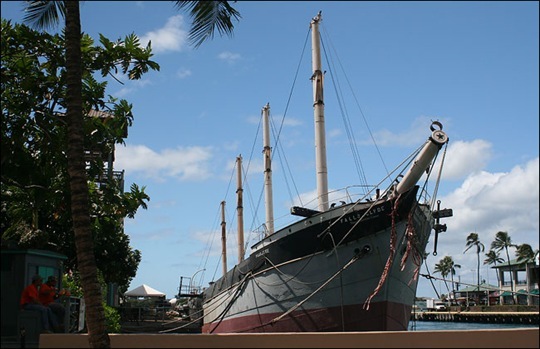 The 1878 ship Falls of Clyde is the world’s only surviving four-masted full-rigged ship. Built in Great Britain in the last quarter of the 19th century during a shipbuilding boom inspired in part by increased trade with the United States, Falls of Clyde made several voyages to American ports, notably San Francisco and Portland, Oregon, while under the British flag. Sold to American owners in 1898, Falls of Clyde gained American registry by a special act of Congress in 1900. Henceforth she was involved in the nationally important Hawaiian transpacific sugar trade for Capt. William Matson’s Matson Navigation Co., a shipping firm of international scope and significance that continues in business. Falls of Clyde, ninth vessel acquired by Matson, is the oldest surviving member of the Matson fleet. After 1907, Falls of Clyde entered another nationally significant maritime trade, transporting petroleum as a sailing oil tanker. Specifically modified for the petroleum trade as a bulk cargo carrier, Falls of Clyde retains integrity of design, materials, and workmanship, and is of exceptional national significance as the oldest surviving American tanker and as the only surviving sailing oil tanker left afloat not only in the United States but also in the world. Nonprofit cultural institutions, like the Bishop Museum, have a moral and fiduciary responsibility to their communities and supporters to act competently as stewards of treasures in their care. While there have been a number of cases over the years where museums have been criticized for selling or deaccessioning works in their collections for various reasons, it’s difficult to recall many that show the alleged incompetence at this scale in preserving a nationally significant treasure. Tagged with museum, National Historic Landmark, New York Times.